But that’s all over now. I am happily settled in my new apartment and now it’s time to celebrate! And guess how I’m doing it? 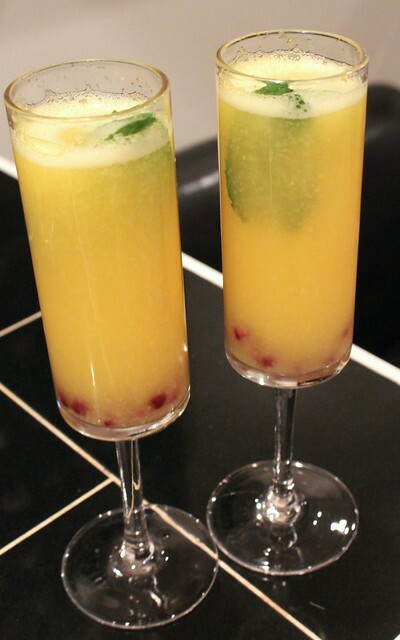 By having friends over to try my latest creation: these mango pomegranate mimosas with mint! What I love about these mimosas is that, by using frozen mango chunks instead of mango juice, I’m not including the added sugars that juice usually has but I am including the fiber, vitamin A, C and B6. Instead, the sweetness in this celebratory brunch cocktail comes from mango’s natural sugars and the added pomegranate seeds. While champagne isn’t the healthiest thing you can have, I think we would all agree that sometimes in life you just have to celebrate. And I have loved celebrating the end of these two very stressful months with some of my best friends. 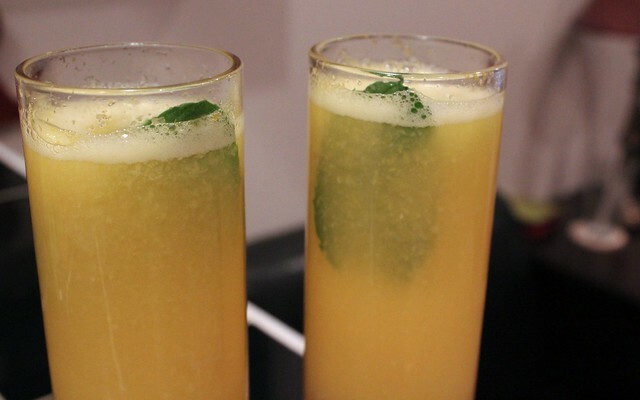 Plus, serving them this healthier-than-usual mimosa with Latin flavors has been quite the treat, too! Celebrate with friends by making this easy, fruity mimosa for brunch. In a blender, combine the frozen mango chunks with 3 cups of water. Blend together until the mango chunks are turned into juice. To make each cocktail glass, put 1 teaspoon of pomegranate seeds on the bottom of a champagne glass. Fill it halfway with the mango juice, then top the other half with champagne. To finish, garnish with 2 mint leaves. How do you celebrate big accomplishments in your life? This entry was posted in Breakfast, Drinks & Cocktails, Entertaining and tagged brunch, cocktails, drinks, mimosa by Irina Gonzalez. Bookmark the permalink.